September is National Yoga Month. Of course, I’m only getting around to mentioning this at the end of the month, but better late than never, yes? Over the weekend I had a friend tell me he was going to his first yoga class and was looking for some advice on what to expect. It’s a fair question, especially if you have absolutely no experience with anything quite like yoga. Not that there actually is anything quite like yoga, though I suppose Pilates could maybe be considered a cousin. This is probably the single most important piece of advice I can bestow. Over the years, yoga has been given an … elitist reputation. As though it’s only accessible for the skinny, the affluent, the young, and/or the female. Or the tree hugging hippies. Nothing could be further from the truth. As y’all know, I love showing off as a curvy yoga ambassador. I love proving that you don’t have to fit some physical ideal to practice yoga and have a ball doing it. Also, I was a vegetarian before I started practicing and one of my regular classmates is an older gentleman. Yes. That initial class will be very intimidating. You’re trying something new and it’s going to challenge your body. I was sore for, like, a week after my first Ashtanga class. Depending on the class or the style, there may be chanting. Threw me off the first time, but now I love it. Love it enough to have a Sanskrit word from the closing chant tattooed to my body. I mean, hello. The first time I had to go to a class different than my regular one, I had to remind myself of this advice. New environment, new teacher. It was scary, but I went in with an open mind and had a fantastic experience. If you’re going to give yoga a genuine and sincere effort, the best thing you can do is check all stereotypes and cynicism at the door and go in blind without any expectation. Believe me, your practice will be better for it. As a curvy yogini, I appreciate more than anyone else the fact that our bodies often physically limit what we are able to do in our practice. Please don’t let that dissuade or discourage you. That’s why a good instructor will encourage modifications and why women like Anna are so awesome. Instead of seeing your body as an obstacle, see it as an opportunity. This is your chance to see the power of your form and you never know, it might end up surprising you. Yoga is a life long endeavor and it’s called a practice for a reason: nobody perfects it, you just continue to be challenged. Take Ashtanga. I’m only in the Primary Series, which means that on the off chance that I ever manage to conquer every pose, I still have the more advanced series and poses — of which there are many — waiting for me. Patience is key. It took me three months to get to headstand and I spent those three months hating the pose. No. Really. I told my instructor as much after one particularly frustrating practice. In other words, unless you are a natural born contortionist, you aren’t going to walk into your very first yoga class and suddenly be super flexible. That’s okay. You aren’t expected to. Take advantage of props like blocks and straps. Use modifications. Realize that there is a very real possibility you will be more open on one side than the other, which means you may be able to do a pose on one side but require assistance if you switch. That’s okay. Also realize the uneven openness doesn’t just go away. Even now I know which poses I can do on one side but can’t on the other. Your body, your flexibility, your openness may change class to class. You could have a fierce streak where you’re rocking a pose week after week and then all of a sudden you go to class and can’t do it. Maybe it takes you a few times to get your legs up in headstand. Maybe you can only do one Wheel instead of two. That’s okay. It happens to all of us at one time or another. Finally, keep in mind that there are people who have been practicing for years who still struggle with certain poses. The point is to at least try every single time you are on your mat. Chances are, when you go to that first yoga class, you are going to have classmates who have been practicing for months, maybe even years. They are going to be more adept at certain poses than you are. Just the natural order of things and you can’t let it get to you. 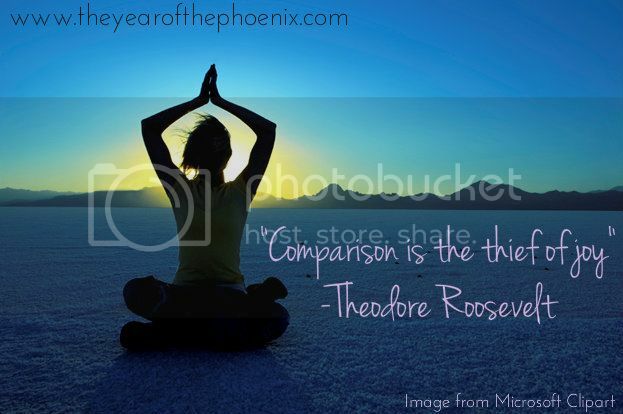 Yoga is not a competition. Yoga is about getting in touch with your spirit. Your body. Your soul. Your practice. Don’t worry about the fact that ol’ Suzy Q can effortlessly grab her hands in Marichyasana. Instead, focus on the fact that with each class your hands are slowly, slowly moving further up your strap. So what if George and you started at the same time and he seems to be progressing at a faster pace? Maybe you can do poses that challenge George, but you’re too busy comparing what you can’t do to notice. Everyone is working at their own pace and that’s the sheer beauty of yoga. That’s why it is so accessible to people, because everyone can come in at whatever level they are at and go up from there. It’s not a race, there’s no rush, no test you have to pass. All you have to do is focus your energy and intentions on your own practice and shut out the rest of the world. In the Gilmore Girls universe, to Lorelai is to scout out places for the best location, be it coffee shop or pizza parlor. In this instance, don’t necessarily judge yoga by your first class. (Unless you have a really awesome one.) Me, I wasn’t so lucky the first time and had I completely written off yoga because of one negative experience, I never would have found Ashtanga and my Saturday morning class with Jessica. Talk about depressing. Each practice, each instructor, each studio has their own vibe and identity. Which means that each class is going to be just a little bit different. Not good different, not bad different, just different different and if you want a successful practice, it might mean trying out different classes until you find the right different for you. Hell, it might be as simple as the time of day. The best decision I ever made was to quit the 6am Ashtanga class. My body is just not awake that early in the morning. At least not awake enough for a 90 minute practice and I’d always leave feeling like I took two steps back from where I’d been the previous Saturday (see: don’t get discouraged). Before I started Ashtanga, I was completely naive to how many practices there are. I just thought yoga was yoga. Not so much. Just because one practice doesn’t flow well for you doesn’t mean there isn’t another one out there. What this also means is that if you are ever made to feel uncomfortable in a yoga class, do not return. Do not pass Go, to not collect $200. Despite it’s current reputation as a form of exercise, yoga is, first and foremost, a spiritual discipline. Take that to mean whatever you want (I mean, hi, I’m an agnostic), but realize that when it comes to your spirit and soul you don’t want to settle on the first available. Understandably, I live in a major metropolitan city and have the luxury of options. Not everyone is as fortunate. #FirstWorldProblems and all. But if you are given the opportunity to have choices, I suggest taking advantage. It might take time to find the right space for you, but when you walk into that studio for the first time and something clicks deep down and you just know in your heart they were waiting for you, the time and effort will be worth it. Any of my yoga practicing readers have any more advice out there for someone considering taking their first yoga class? My very first yoga class, I was met with a very subtle sizest attitude from the instructor, so I definitely understand where you are coming from. Some in the yoga community still aren't entirely sure what to do with us, but the attitude is slowly changing. A lot of it thanks to Anna at Curvy Yoga. Definitely check out her website if you aren't familiar with it. I so agree that if you do not feel comfortable in a class, do not return…find another one. I have tried yoga on and off with varying degrees of success. In general, I think the times that I have thoroughly enjoyed the sessions are the times that I went in with the RIGHT attitude. I was open to relaxing and letting go…a very hard thing for a Type A person to do. In addition, the times I have felt that I have gotten the most out of a yoga class is when the environment was also relaxing…the gym classes just don't do it for me. I like the classes up in the mountains, at sunset in the park, etc. Here is the biggest thing..if you don't like to be touched, say so. I have found that there are too many pushy yogis who insist on helping you get into a pose. I don't like being touch and I let them know that. There is nothing that ruins a class for me more than someone trying to push me body into a pose that it is just not ready for (be it mentally or physically). Some day I will become more of a regular yoga practitioner but for now I leave it for those times that my mind is ready to accept it (usually vacations).